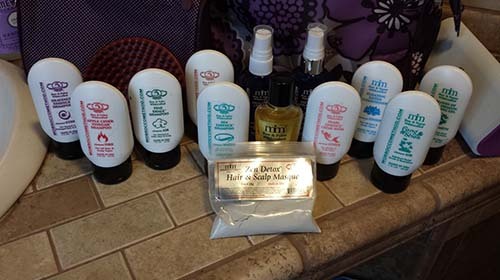 I recently received a Health Hair Starter Package from Morroccoo Method Hair Care. This is no ordinary hair care line. These natural hair products are completed raw, vegan and gluten-free. They amazingly nourish your hair completely chemical free. It's really like a raw food diet for your hair, as only nutritionally dense ingredients are used. This package includes all five shampoos, all six conditioners, styling gel, facial scrub and a scalp massager. Everything you need on your journey to all natural chemical free hair. For best results, it is suggested to rotate all five shampoos. I have tried lots of hair care products the past few years, but never completely natural like Morrocco Method. These shampoos clean your hair really well, but without the heavy lather that we are used to from store brand shampoos. The conditioners add extra hydration and nourishment and the styling sprays add moisture to tame down frizz. The first two weeks is like a detox period for your hair. You get rid of all the old product build up, and really notice your true hair essence. Since I have naturally wavy, curly hair, I noticed really full curls showing up all over that were usually weighed down by products. My hair became super soft and curly as it brings out your natural hair texture and feel. Overall, I'm really liking the result, as after about a month of use, my hair feels and looks like virgin baby hair. It also appears to be thicker and very shiny. I would definitely recommend this natural product line for those looking to transition to all natural, by bringing out your natural hair beauty the way nature intended. Most people are used to the Shampoo & Conditioner duo, where you can't have one without the other. But this is just the cycle of harmful surfactants like Sodium Lauryl Sulfate and Cocamide DEA. Shampoo strips out all the beneficial oils from your hair and causes damage to the hair. That is why your hair is "squeaky clean" afterward. Then in order to get it manageable and soft, you need to use a conventional conditioner. These include ingredients like silicones, which fill in the gaps in your hair and coat the cuticles to make them smoother and softer. Which are then stripped away with harsh cleansing shampoo, and the cycle repeats itself! When our customers go through detox, this layer of chemical conditioning gets stripped away first—this reveals the damaged state of their natural hair. Many mistake our shampoos as the cause of the unruly, rough texture, when it's really what their natural hair looks like! But once you detox, Morrocco Method products help you heal and mend those damaged strands with all natural ingredients. So why does Morrocco Method have conditioners? Because some people need the additional hydration and healing of all natural conditioners! Others find our shampoos are conditioning enough by themselves. Try out our full line of shampoos and conditioners, then listen to your hair to judge what is best for you. You can visit morroccomethod.com to see their natural hair care products.